A cookie (a ridiculous term) is a small file that a website automatically saves on the hard drive of your Mac, containing information that the site will use on your future visits. Unfortunately, for these purposes, cookies aren’t yummy treats made from flour, sugar, butter, and eggs. A site might save a cookie to preserve your site preferences for the next visit or — in the case of a site such as Amazon.com — to identify you automatically and help customize the offerings you see. In and of themselves, cookies aren’t bad things. Unlike viruses, cookie files don’t replicate themselves or wreak havoc on your system, and only the original site can read the cookie it creates. Many folks, however, don’t appreciate acting as gracious hosts for a slew of little snippets of personal information. Click the Privacy button. Safari displays the Privacy preference settings. Allow from websites I Visit: This option allows sites such as Amazon.com to work correctly without allowing a barrage of illicit cookies. Allow from Current website Only: Block cookies from everywhere but those that operate on the current site. Always Block: Block all cookies. Always Allow: Accept all cookies, which essentially allows any site to save cookies on your Mac. To view the cookies now on your system, click the Details button. 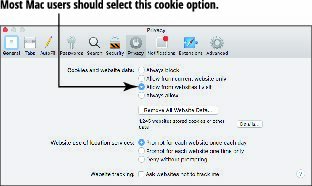 To remove all cookies and data, click the Remove All website Data button. If you block all cookies, you may have to take care of some tasks manually, such as providing a password on the site that used to be read automatically from the cookie.